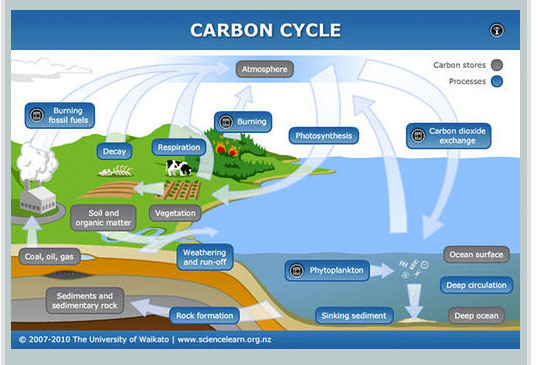 This interactive webinar is designed to help secondary school teachers teach climate science. The content focus of this session is the biosphere as a major driver of the global carbon cycle and how changes in the carbon cycle impact ecosystems, which is part of Principle 3 of the Climate Literacy Principles. Note: This webinar has already taken place. Registration - (Note: Registration is now closed)There is no registration fee, but registration is required to save a space. Because space is limited to 15, please be sure you can commit before registering. Registration closes when the spaces fill or one week before the webinar, whichever comes first. Dr. Rooney-Varga, a microbiologist, is Associate Professor of Biological Sciences at the University of Massachusetts, Lowell, and Director of UMass Lowell's Climate Change Initiative. Ms. Dunlap is a curriculum writer and professional developer at TERC, with a 28 year background teaching high school biology. Learn more about Climate Principle 3: Life on Earth depends on, is shaped by, and affects climate. See teaching activities related to teaching this concept.